Just sign in with your e-mail and password below and let’s get rockin! Don’t worry, joining the CLUB NESCAFE DOLCE GUSTO is as easy as making your own cup of NDG! JOIN CLUB NESCAFE DOLCE GUSTO NOW! With over 9 delicious drinks to choose from. Drop is a gorgeous automatic capsule coffee machine, inspired by a drop of coffee. It’s 25cm (W) x 32cm (H) x 25cm (D). With Drop’s, up to 15 bar, pressure system you will enjoy a professional coffee with a thick, velvety crema. Coffee freshness is preserved with our hermetically sealed capsules, for a rich and aromatic cup. Take you pick from over 30 high quality coffee creations: choose from our range of intense espressos, smooth cappuccinos, aromatic Grandes, even hot chocolate, teas, and many more. 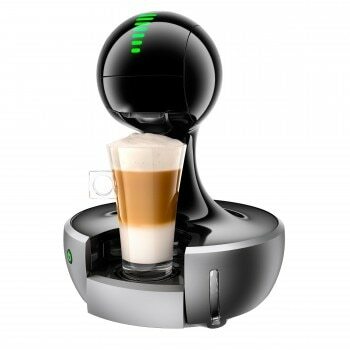 The adaptable Drop capsule coffee machine can prepare not only hot, but also delicious cold beverages. Eco mode automatically switches off the machine after 5 minutes of inactivity. The machine has an A rating for energy consumption. With the two-year guarantee, you don’t have to worry about your machine. Best of Best Winner of the Red Dot award 2016. If the on/off button of your machine has turned orange, it’s time to descale! For more information about the automatic descaling alert on your NESCAFÉ® Dolce Gusto® Drop machine, click here.